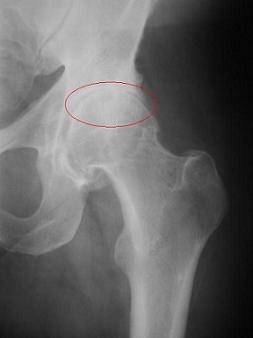 Hip osteoarthritis is one of the most common and frequent causative factors of hip joint pain . This is the wear-and-tear version of hip degeneration, where both the femoral head and acetabulum (ball and socket) have lost enough of the plush hyaline cartilage to expose the underlying bone, thus creating significant pain, and even mobility problems. 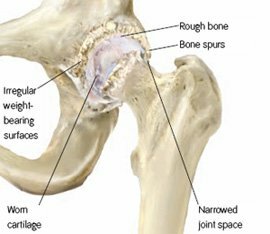 As the condition becomes more chronic and severe, bone spurs begin to develop around the perimeter of the acetabulum and femoral head, further reducing movement and increasing pain levels. Persons suffering with this begin to walk differently and limp, often being told they "walk like a penguin". Going up and down stairs becomes increasingly difficult, and prolonged sitting is painful. This condition can occur in only one side(unilateral), or both sides (bilateral). Many people complain about knee pain, and often present to a doctor’s office thinking they have a knee problem, only to be shocked to learn their hip is bad. This is called "referred pain" and actually originates in the hip. This pain can also be felt along the thigh and even into the buttocks. People often notice, as the degeneration progresses, a change in the way they walk, frequently adjusting the rotation of their leg and even "leaning over" the bad hip to reduce pain. For mild to moderate symptoms, treatments can include non steroidal anti-inflammatory drugs (NSAIDS), steroid dose-packs, narcotic pain medications, water-based physical therapy, and on rare occasions, steroid injections directly into the joint. For advanced, end-stage disease, the best treatment is joint replacement surgery .